Plywood flooring is complete! I could not be happier with how this turned out and may end up doing the other rooms in our home with this same process. 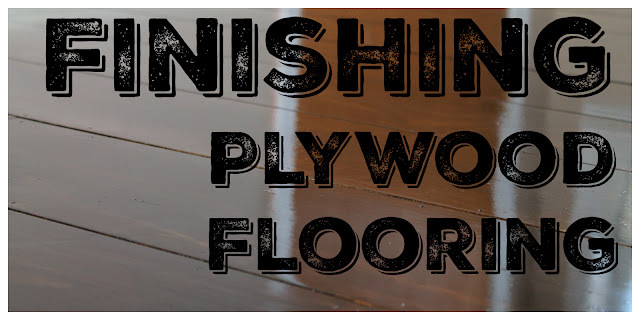 If you have not seen the process of creating the plywood flooring please check out the article here or the full video here. Before I got started with staining I chose to run over the entire floor with a 150 grit power sander. I did not spend a whole lot of time on it just enough to take any dings, dents, and scuff marks out that I most likely added while installing the flooring. Once this was done I cleaned the entire room as best as possible with a vacuum and damp towels and we were ready for stain. I chose a Minwax dark walnut stain to give the floor a dark old farmhouse kind of look. You can apply this stuff many ways but what I found to be the best was a homemade creation as usual:) I used an old Swiffer mop handle and head and stuck a cotton t-shirt to it. I dipped the contraption in the stain using a paint tray and then spread it on the flooring. This saved my back, a lot of time, and applied the stain fairly evenly. After the first coat things were starting to look really good but a little bit lighter than we had hoped. Two coats of the stain were applied about 24 hours apart which gave the floor a deep rich color that we absolutely loved. It was really starting to come together now. This is the point at which I began feeling relieved that this project was going to turn out exactly how we wanted it to. Once the stain fully dried we were ready to start putting on the final protective coating. We chose a Minwax flooring polyurethane to seal the floor. This seemed to be the best, most durable, and easiest to apply option. I started applying the poly one coat at a time with a small paintbrush. This method worked very well and although a bit slow, this stuff goes on very easily. I applied 4 coats of poly allowing each coat to dry for 6-12 hours before putting on the next. This is a quick drying poly so you can put it on in as little as 4 hours if you would like. I did not sand between coats; as directed this stuff is supposed to dry pretty flat without needing to sand each coat. After 4 coats were applied I chose to do one round of sanding to knock out a few bumps I was starting to notice and some dog hair that somehow floated into the room and had dried into the finish, stinkin' dog! I used a power sander with 220 grit paper and I did not push very hard at all while sanding. I just let the weight of the sander float on the floor until it was smoothed over very lightly. Next I cleaned the floor with a damp cloth and applied the final coat of poly. I applied this final coat a bit thicker and let it dry over night. How much did it cost? The room that I was covering was about 165 square feet and the total cost was about $253. This works out to about $1.50 per square foot and is much cheaper than traditional hardwood flooring. Excellent job! Been keeping your site in an open tab all week for reference as we work on our own plywood floors. Like what you're doing on the "homestead!" Thanks so much! Hope everything is great with your project. I'll be starting my second plywood floor soon in our oldest daughter's bedroom, we are really happy with the results! If you are choosing new dining room furniture or new tables or bedroom sets, chances are the chair backs; drawer and door panels will be made from good plywood. Various tropical woods have been acclaimed as naturally cordial because of their snappy development rate. The snappiest self-replenishers are bamboo and plug (nor are a wood).